Their bite is also intricately painful. This entry was posted on 05/02/2015 at 12:05 and is filed under Photos. You can follow any responses to this entry through the RSS 2.0 feed. You can leave a response, or trackback from your own site. Very interesting take on intricate, steveo. I had to get rid of one once a long time ago, with wasps still in it. Not pretty. Thanks. Just needed half an excuse to use an old photo. As for the wasps, hope you were a fast runner back then. 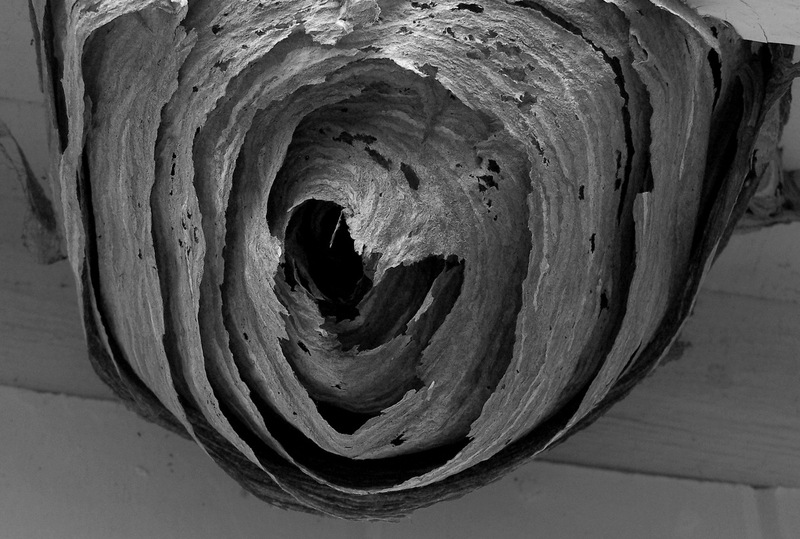 Wasps’ nests and bee hives are truly amazing structures. Many many times better than my construction projects! I can only wish to do as well. Fortunately, this one was on the outside of the garden shed – and abandoned when I took the picture. … I had to wait till mine was abandoned it had guards patrolling, wasn’t able to get in shed for months! A very safe approach to the problem. Are they ever but look how much work they have put and guard their intricate paper thin house. Yep. It’s amazing how they know how to do what they do.